Carolyn and I are looking for extension cords. 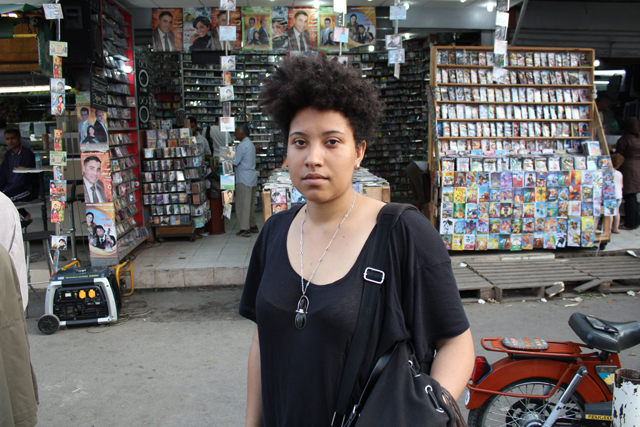 And a few hundred pirated Berber CDs. And two RCA to 1/8″ cables to convert the stereo in our apartment into monitors for our video work. And maybe an extra bed. We definitively need some fabric to turn one of the salons into a bedroom. And it would be great to find the Apple store to get a video adapter. And an avocado juice. And some washing rags. And gaff tape. Oh and a plastic basin. We are in a taxi to Derb Ghallef where all of these things should be easy to find. 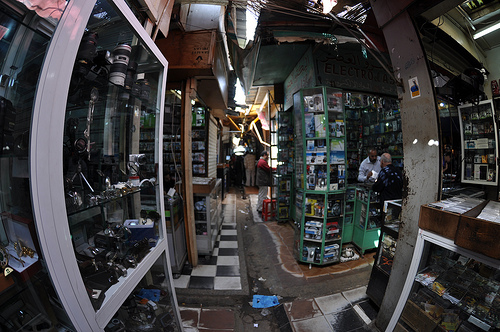 In Derb Ghallef, one of Cassablanca’s biggest souks, nearly everything is pirated. Either blatantly a knock off, or priced in a way where you know it skipped regular import duties. Even the logos on the Sham-Wow cloth looks suspicious DIY. It is hard to imagine how exactly all of these things have arrived here- and how cheaply. There are endless rows of shops selling hacked chips for satellite TV, blackberries and their various unbranded duplicates, homemade printer fluid, and an entire shop dedicated to pirated childrens dvds. A man sprints past us into a mattress store. As we walk by a brawl has erupting between fifteen grown men in the back surrounded on all sides by stacks of couch cushions and carpets. We gawk for a minute and keep walking. I wonder aloud to Carolyn what they were fighting about. “Money,” she assumes. Earlier I read a French magazine article that claimed over half of all Moroccans visit this market in any given year. After circling from different entrances, ending up in an annex of used sports equipment and finding most of the things we needed- we end up at a big CD shop near the street. My french is useful for taxis and ordering but not much else, so Carolyn does the talking. We want to know who runs the shop, what sells well, what their thoughts are on Berber music and autotune. What I really want to know is where the pirated cds come from and how much, if any, fear these retailers have for selling so many CD-Rs. This is apparently not the place we want to be, I’m told I cannot take any pictures, and the employee sent to chat to Carolyn starts his conversation by going on a tirade against pirating, claiming its ruined everything, all the while surrounded by grainy photocopies of Tupac and Um Kulthum. We leave wondering if they thought we were industry spies. On to the next one.